A US original Dorsal-Impact glove. The Westchester Rugged Rigger has 4-way stretch spandex on the back of hand. The West Chester 86710 has a synthetic leather palm with reinforced silicone pattern, TRP knuckle, finger and back of hand protection. It has an extended Kevlar® reinforced thumb saddle, Synthetic leather forchettes, oil resistant palm with silicone pattern for grip, ID tag on cuff to protect investment, neoprene cuff with spandex for added comfort. Conforms to EN 388 4.1.2.1 Safety Standard. High levels of grip obtained through the Tefloc grid system. Provides user with exceptional grip in any condition. Impact protection for the back of the users hands. Level 2 Cut and Puncture Protection. HexArmor GGT5 Gator Grip 4020X Gloves are manufactured to provide cut, puncture, and impact protection. These gloves are designed to protect the major injury points - finger pinching, severe cuts, abrasions, and crush injuries. Excellent grip capabilities designed to cope with wet, grease and similar situations. Gator Grip Technology® prevents formation of oil film and displaces oil, allowing maximum contact with tools and other surfaces in saturated conditions Puncture protection from wickers, burrs and cable wire. Full Impact Exoskeleton™ with high performance IR-X smash guards provides greater impact protection. It also includes high visibility colours for increased safety. Made with SuperFabric brand material which gives the highest cut resistance protection, SuperFabric brand material specially developed for the oil and gas industry. Polyco HexArmor GGT5 Grip 4020 Impact Protection Glove conforms to: EN388 4.5.4.2 Cut Level 5. Impacto Dryrigger oil & Water Resistant Glove help prevent hairline fractures, injuries, bruising and pinched fingers. Made to protect the hand and fingers from impact and abrasion, and designed to ensure excellent dexterity, fit and comfort. 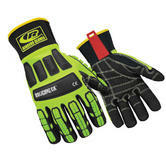 This is the ultimate hand protection for workers in the oil and gas industry. Insulated Lining protects when working in low temperatures. Heavy duty TPR padded across the knuckles. 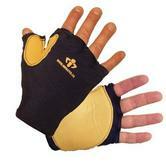 Heavy duty TPR on back of fingers, thumb & back of the hand protects against bruises & bumps. Durable patches in the webbing area assure long wear made with 100% KEVLAR®. Impacto Dryrigger Oil & Water Resistant Glove conforms to EN388:2003 and EN420:2004 Safety Standards. Manufactured from a durable synthetic leather material. Designed with hard TPR protection zones on fingers, thumbs and back of hand areas for impact protection. The palm area of the glove is textured for extended grip. High performing base that was designed with user comfort in mind. The palm area is resistant to oils and water. Conforms to EN388:2003 3.2.3.1 Safety Standard. Quite often the impact gloves on the market are unfit for the demanding line of work; for this reason Roots developed a product that also provides protection against oils and chemicals and offers a level 5 blade cut resistance. The glove have a full hand nitrile coating. The impact protection guards are in the inside of the gloves. Overall they achieve a remarkable level of comfort and dexterity. Roots RO8005 Men Impact Protection Gloves conform to: EN 388 4.5.4.2. protection standards. TPR impact protection on top of the hand and full length of fingers. Hi Vis colour scheme makes them stand out more improving user safety & product identification. Soft nitrile foam dip with a sandy finish for additional grip and comfort. Durable yet breathable knit shell, lowers build up of sweat and odours. 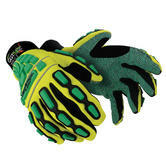 Ringers R-065 Tpr Green/Orange Impact Protection Glove conforms to EN388 & EN420 Safety Standard 4.5.4.3. The Extreme Impact Protection glove with Maximum cut resistance (Cut 5). PU/Silicone grip in palm giving exceptional cut protection and oil and fluid resistance while keeping flexibility and good grip. Premium quality microfibre, oil & fluid resistant spandex on the back of the hand. Materials: Microfibre for comfort & longevity, Keprotec Schoeller (Kevlar cut resistance), Neoprene and Spandex, TPR injection, EVA. Wenaas eXtreme 6-6363 Impact Glove conforms to: EN420:2003, CE Category 2, EN388:2003 4.5.4.3. standards. Conclusion: Barely anybody knows about it: that you can get a glove with level 5 Cut protection, as well as proper dorsal Impact protection: A Wenaas Innovation, being gradually discovered across the North Sea Oil Rigs. TPR impact protection on top of the hand providing maximum protection to knuckles and fingers. Seamless index finger design, providing additional protection in vulnerable zones. Elasticated wrist band for improved product security and comfort. Manufactured from high quality synthetic leather. With a hook and loop fastening System. Conforms to EN388 Safety Standard 3.5.4.3. 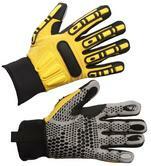 These Roots Rigger Impact Protection Glove offers ergonomic design and excellent comfort. Roots Waterproof safety gloves offers superb impact protection, while a perfect mobility is preserved. Can be used when working with hand injuries. Perfect wearing comfort due to extremely light weight material. Offers maximum protection due to highest quality materials and technology. The various components are processed to a fabric construction which ensures extreme rub-proofing, tear resistance and perfect heat-friction resistance. Schoeller-Keprotec® palm: is made using only the highest quality materials, contains Kevlar®, an Aramide fiber which can be 5 times stronger than steel. Conforms to European standards: EN420 and EN388 3.2.4.2 safety glove standard. Manufactured from a Nylon material that offers improved breathability & comfort. Reinforced padding can be found in the palm and thumb areas. The fingerless design allows the user to maintain dexterity & accuracy. The Grain leather used improves the durability of the product. It also protects against abrasion. Conforms to EN 388:2003 Mechanical Risks 2.2.4.3, EN 420:2003 General Requirements. Ansell 97-321 Mad Grip Impact Glove offers great back-of-the-hand protection. The soft and comfortable thermoplastic rubber coating absorbs all impact, protecting the back of the hand. Highly dexterous and flexible, is maintained due to this unique compound and structure of the glove. MadGrip Injection Technology allows for reinforcement in high use areas of the glove for extended durability and comfort. Ideal for General material handling. Ansell 97-321 ActivArmr Mad Grip Impact Glove complies to EN388 safety standards. Designed to offer maximum protection and comfort whilst performing chainsaw tasks. 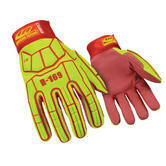 Protective material in the left glove only to EN381-7 Class 0, 16m/s. Portwest A290 Oak Chainsaw glove conforms to: EN 420, EN 388 (3.1.2.3.) 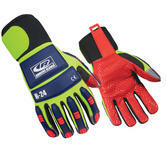 and chainsaw Protective material in the left glove only conforms to EN381-7 Class 0, 16m/s. Elasticated knitted wrist offer comfortable fit and prevent sawdust and dirt access the glove. Made using 60% Cow full grain Leather, 25% Polyester, 10% Polyethylene and 5% Elastic. Designed with knuckle protection that provides superior impact protection. Manufactured with reinforced ergonomic palm and thumb areas improving comfort. Strategically placed back of hand and specific knuckle protection provides superior impact protection whilst maintaining dexterity to the user. Reflective knuckle band with rubberised logo provides greater visibility and protection. Terry cloth thumb delivers sweat management for high exertion tasks. Reinforced ergonomic palm and thumb protection provides improved impact and comfort when handling materials. Materials: Neoprene reflective band, Polyester, Spandex, Synthetic leather, Terry cloth liner. Ansell 97-973 Projex Black/Grey Impact Glove conforms to EN388 4.2.2.1 Category II Safety Standard. Prevents wrist strain injuries whilst carrying out manual tasks. Designed with a natural heat therapy system that prevents and treats injuries. Reinforced design with lining that wicks away moisture that prevents skin irritation. Durable nylon construction ensures a long product life. Manufactured from a nylon mesh liner with a leather palm designed for impact protection. Back of hand and finger areas reinforced with impact resistant rubber. Reinforced thumb and forefinger areas for improved protection. The adjustable Velcro wrist strap ensures a secure fit. 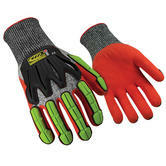 Polyco Impact Multi-Task L Glove conforms to EN388 2.1.2.1 Safety Standard. Ansell 97-975 are the perfect glove for general purpose tasks. Reflective knuckle protection and Terry cloth for draws away sweat. Neoprene slip wrist stops debris entering the glove. Complies to EN388 safety standards. Designed with thermoplastic rubber protection on the back of the hand and fingers. The rubbers used lowers impact injury, and has been constructed for total flexibility. Nitrile Reinforced thumb and forefinger areas for added protection. Manufactured with a Velcro wrist strap to provide a secure fit. Multi-Task E gloves are flexible with a nitrile palm coating featuring thermoplastic protection inserts on the hand and finger areas. Users are safe guarded from any impact injuries due to the added protection which does not restrict any movement allowing you added freedom. Polyco Impact Multi-Task E Glove conform to: EN 388 2.1.2.1. Safety Standards. Impact injury and skin abrasion resistant. The unique design of the Impact Guard frees your index finger for smooth trigger guard entry and mobility. The two layer internal fingertip construction reinforces the thumb and index finger for improved abrasion protection. The embossed fingertip pattern improves feel and overall dexterity. High-impact XRD padding in the palm absorbs impact and vibration. Manufactured with a double synthetic construction for improved durability. Constructed using keprotec fabric by schoeller, this high-performing and comfortable protective base material contains high-tensile aramid fibres to enhance durability and provide temperature stability. Protective TPR zones on each on the knuckles, fingers, thumb areas and back of hand. Contains high tensile fabrics that further improve the products durability. Globus Torque Stealth Impact Resistant Glove conforms to EN 420, Cat. II EN 388 3.2.3.1 Safety Standards. Of course we all value our fingers and hands:So why did it take the glove experts so long to invent Impact protection for hands? Who knows? - but the oil sector pioneered the take up of impact gloves to protect hand injuries from pinches, hits and bruising. They dropped the standard rigger gloves in a heartbeat,and insisted on proper anti impact gloves. ("impact resistant gloves or "anti-impact gloves" are just synonyms for what people refer to as "impact gloves"). The US Ironclad gloves developed the Kong Gloves for impact protection. (Ironclad gloves)and West Chester (West Chester Rugged Rigger 86710). These 2 brands may have been the original impact glove manufacturers; but they were soon followed by better impact gloves from Ringers (better grip, dexterity and wrist protection). 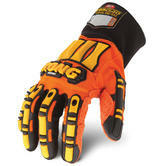 See for example: the Ringers Roughneck Tefloc or the Ringers R-24 - some of the finest impact gloves by Ringers. Mechanix gloves evolved from being the finest gloves used by Nascar mechanics, to producing nimble, dexterous Mechanix impact gloves such as the covert M-Pact impact resistant gloves. Wenaas of Norway arrived with the Wenaas Offshore Impact glove and the Wenaas Waterproof Winter (thermal insulation) and the brilliant Wenaas Mechanic (dexterous) and the Wenaas Extreme (Cut 5 protection impact glove!). Impacto - the anti vibration gloves, now also offer Shock Absorption on the palm and with Dorsal Impact Protection on the back of your hand and fingers, on their Impacto DryRigger glove. The recent launch of the Ansell Mad grip impact glove shows where innovation is going. This bright orange impact-reducing glove is loud, bright, clever and pretty ingenious. Take a look at it! Impact gloves are now used widely by police officers, motorbike riders, and construction industry workers as well as the original oil roughnecks, as everybody realises the merit of protecting your fingers from hits. There is no EN standard yet for impact gloves industry (EN13594 is only for motorbike gloves), but our impact gloves are certified to EN420 General gloves standards and EN388 Mechanical risks standards. We have probably the largest range and deepest stock of any impact gloves online! The choice is yours. Protect your little fingers with proper impact protection - by wearing impact gloves.